Let’s Get Cooking: Coconut Milk | "Where in the world are Barry and Renee?" Given proper care and growing conditions coconuts palms grow rapidly, can produce up to 100 coconuts a year, and live to be 100 years old! So if you are lucky enough to have access to coconuts – and they are grown in more than 90 countries around the world, one delicious way to use them is to make your own coconut milk. Ryan Burden, a young man from Hā’iku, Maui, on a mission to get more people to eat coconuts, niu in Hawaiian. One older, shaker coconut [almost fully mature, these coconuts have thick meat and are rich in coconut oil]. Split the coconut in half by tapping firmly around the circumference. Tip: You can use any hard surface, like the back of a machete, a cleaver, even a stone. Scrape out the meat using a coconut tool or butter knife; cut into 2-inch pieces. Fill a high-powered blender halfway with coconut pieces and top with water. Water from a sweet coconut is best, but you can use plain H20. If you do, add a teaspoon of honey and a pinch of salt. Tip: Make sure the water is at least 73 degrees; otherwise, the oils won’t emerge. Blend on high for 30 to 45 seconds. Tip: Coconut meat is tough. Gradually increasing the speed avoids overheating the blender. Strain through a nutmilk bag or fine cheesecloth. Squeeze out every bit, and put into a jar. Fill to the very top, leaving no air in the jar to spoil the water. Chill immediately. After the jar is opened, milk will keep for up to a week in the refrigerator, but is best enjoyed within two days. 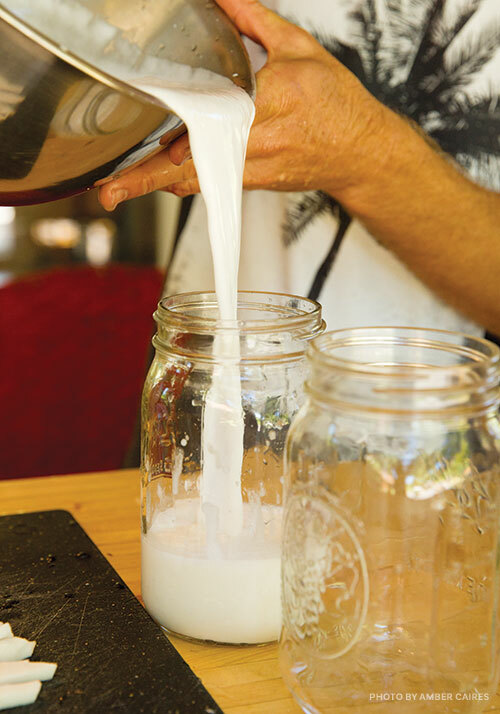 Have fun making – and drinking your homemade coconut milk.